One who savors the joy of drinking the perfect cup of coffee, would also be most happy to receive the perfect coffee gift – and illy has plenty of inspired gifts sure to enhance every pleasurable coffee drinking moment. From a huge selection of gift sets, beautifully designed illy Art collections of cups and tools for brewing the perfect cup of delight – there is something for every coffee lover on your holiday shopping list. Share your passion for illy this holiday with NEW Signature ‘illy-red’ holiday gift boxes. Festive and elegant in illy red and embossed with that iconic logo, these stunning boxes provide the perfect finishing touch to gifts of your choosing, or pick from a variety of distinctive pre-boxed illy gift sets. Extraordinary taste all wrapped up. Consider simply giving the gift of never running out of coffee, with the illy a Casa home delivery program. 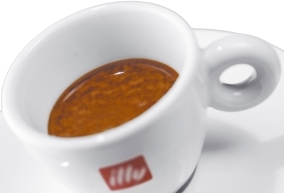 While your at it…be sure you have enough illy coffee on hand to entertain your guests this holiday season.